Two years ago today, we stood inside the Apple Store on Regent Street, London watching in disbelief as a queue of people waited outside to spend £269 on the first generation of the Apple iPhone. And that was before you got to the £35-a-month O2 contract. At 6.02pm the doors opened. The launch was hectic and disorganised. At the time we noted the scenes resembled Beatlemania. We headbutted a cameraman and tripped over a newspaper photographer - it was a real battle for elbow room as Apple hosts greeted the first few buyers through the door with whoops and chants. Buyers went through the back of the store, purchased their phone upstairs, and emerged at the top of the glass staircase to be captured by the waiting photographers. At the launch Nick Wilkins, O2's PR manager, said the turnout was "quite mad". "It's so great to see so many people here. I'm really proud of what we've done." 2007 launch: Was it a success? Since it had been announced at Macworld the previous January (to the open-mouthed amazement of everybody at the rival CES), Apple's long-rumoured handset had become the most hotly awaited gadget of the year. 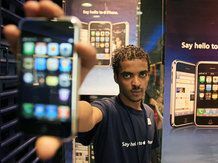 The anticipation was only heightened after the US launch that June with UK appetites whetted by images and walkthroughs from across the pond as well as the announcement of O2's exclusive deal in September 2007. "The iPhone captured consumer attention in a way that other devices only aspire to," says Tony Speakman from Apple subsidiary and app developer FileMaker. "Its introduction and subsequent popularity is indicative of the consumerisation, not just of mobile phones but of the concept of truly 'mobile' technology." Although iPhone v1 naturally wasn't a world away from what we have today, let's not forget that the original iPhone was hobbled horribly by the lack of 3G. It had no third-party apps. No GPS. And the headphone socket was proprietary, so you had to use the original headphones. How you bought an iPhone was also different. For the first generation, you just walked into a store, bought the phone and signed up to a contract via iTunes when you got home. However, the process didn't make it onto the next generation. It was open to abuse and Apple or O2 lost countless handsets to people who shelled out only the £269 and jailbroke them instead of signing up to an O2 deal. Still, Apple sold 6.1 million original iPhone units over the next year and a quarter worldwide – it sold 7.4 million in the three months before September this year. 02 shifted 190,000 iPhones in its first two months on sale – it has since sold well over a million handsets.